cone calculator - step by step calculation, formulas & solved example problem to find the area, volume & slanting height of a cone for the given values base radius & height in different measurement units between inches (in), feet (ft), meters (m), centimeters (cm) & millimeters (mm). In geometry, cone is a solid or hollow object with a round flat base and sides that slope up to a top point. The cone formulas, solved example & step by step calculations may useful for users to understand how the input values are being used in such calculations. Also this featured cone calculator uses the various conversion functions to find its area, volume & slant height in SI or metric or US customary units. The following mathematical formulas are used in this cone calculator to find the area, volume & slanting height of a cone. The below solved example problem may be useful to understand how the values are being used in the mathematical formulas to find the area, volume & slanting height of a right circular cone. Find the area, volume & slanting height of a right circular cone having the base radius & height of 15 cm & 7 cm respectively? The area, volume & slanting height of a cone may required to be calculated in SI or metric or US customary unit systems, therefore this cone calculator is featured with major measurement units conversion function to find the output values in different customary units such as inches (in), feet (ft), meters (m), centimeters (cm) & millimeters (mm) by using this below conversion table. 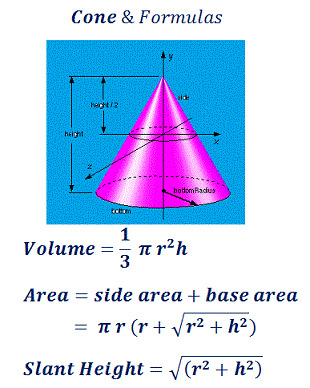 In the field of area & volume calculations, finding the area, volume & slanting height of a cone is very important to understand a part of basic mathematics. The above formulas, step by step calculation & solved example may helpful for users to understand the how to calculate area, volume & slanting height of a cone manually, however, when it comes to online to perform quick calculations, this cone calculator may be useful to find the results.